It is evident that the word spade refers to the instrument used to move earth, a very common tool. The same word was used in England, Denmark, and in the Netherlands, Erasmus’ country of origin. The Oxford English Dictionary records a more forceful variant, “to call a spade a bloody shovel”, attested since 1919. The phrase predates the use of the word “spade” as an ethnic slur against African Americans, which was not recorded until 1928; however, in contemporary U.S. society, the idiom is often avoided due to potential confusion with playing card references such as “black as the ace of spades”. So far, so good. 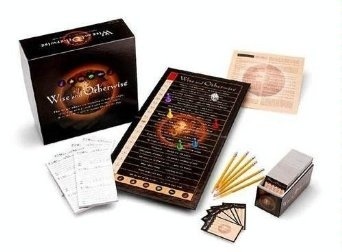 But my family is fond of the party game Wise and Otherwise, described by one reviewer as “Confucius plays Balderdash”. The aim of the game is to complete the second half of a proverb, and then to pick out the genuine proverb from the ersatz ones submitted by players. In both the composing and the guessing stages of this game, it is desirable to find some inner logic to the proverb. That is simply the way human beings work: we are logical creatures, and so our proverbs are logical. So it is impossible to be satisfied with the English saying “to call a spade a spade”. 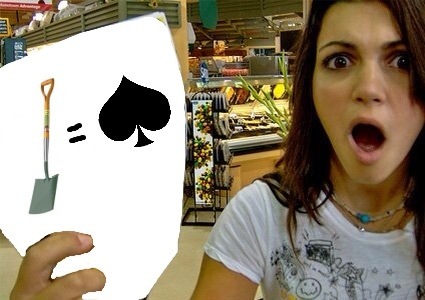 Why spades? Is there something about shovels that makes people avoid naming them accurately? I could understand if the proverb were “to call Voldemort Voldemort” or “Satan Satan”. But there is not, on the face of things, any logic in “to call a spade a spade”. Was there ever? Has it been lost? Can we unearth any? Its ultimate source is Plutarch’s Apophthegmata Laconica (178B) which has τὴν σκάφην σκάφην λέγοντας (ten skafen skafen legontas). σκαφη (skafe) means “basin, trough”, but Erasmus mis-translated it (as if from σπάθη spáthe) as ligo “shovel” in his Apophthegmatum opus. Lucian De Hist. Conscr. (41) has τα συκα συκα, την σκαφην δε σκαφην ονομασων (ta suka suka, ten skafen de skafen onomason) “calling a fig a fig, and a trough a trough”. The Wikipedia article is mistaken. The quotation from Plutarch is not from the Apophthegmata Laconica (“Sayings of the Spartans”), which has Stephanus pages in the 200s, but from the similar Regum et imperatorum apophthegmata (“Utterances of Kings and Generals”), also by Plutarch and also part of his larger collection, the Moralia. I also suspect that the article is also mistaken about word for which Erasmus mistook σκαφη. It is more likely that Erasmus was thinking of σκαφείον, spade, hoe, mattock, than that he was thinking of σπάθη, which is more often the blade of a sword or an oar, and does not start with σκ-. To make matters more complicated, LSJ distinguishes two different words spelled σκαφη. One, accented on the first syllable, is a ditch, or something dug – cognate, obviously, with σκαφείον, both being from σκάπτω, the verb “to dig”. The other, spelled exactly the same way, but accented on the last syllable, means “a bowl”, or “a kneading trough or baker’s tray”, or “a washtub”, or even “a bowl or tray on which offerings were presented by metoeci at the Panathenaea”. So we have many options for this word, but “spade” is not one of them. The English proverb rests on a mistake by Erasmus. Misled by Philip’s mention of “rustic” Macedonians, Erasmus assumed that the object in question must be a tool of rustics. τῶν δὲ περὶ Λασθένην τὸν Ὀλύνθιον ἐγκαλούντων καὶ ἀγανακτούντων, ὅτι προδότας αὐτοὺς ἔνιοι τῶν περὶ τὸν Φίλιππον ἀποκαλοῦσι, σκαιοὺς ἔφη φύσει καὶ ἀγροίκους εἶναι Μακεδόνας καὶ τὴν σκάφην σκάφην λέγοντας. Lasthenes the Olynthian and his friends being aggrieved, and complaining that some of Philippus’ retinue called them traitors, These Macedonians, said he, are a rude and rustic people, that call a σκάφη a σκάφη. Which of the meanings of σκάφη best fits this context? One possibility is that Philip is taunting Lasthenes’ party with the fate of their city, which was razed, and the foundations of which were dug up. “You are citizens of a ditch now. Well done.” But this is not a good fit for the context, in which Philip is confirming the slur “traitor” that was put on Lasthenes by the Macedonian soldiers. τοιοῦτος οὖν μοι ὁ συγγραφεὺς ἔστω, ἄφοβος, ἀδέκαστος, ἐλεύθερος, παρρησίας καὶ ἀληθείας φίλος, ὡς ὁ κωμικός φησι, τὰ σῦκα σῦκα, τὴν σκάφην δὲ σκάφην ὀνομάσων, οὐ μίσει οὐδὲ φιλίᾳ τι νέμων οὐδὲ φειδόμενος  ἢ ἐλεῶν ἢ αἰσχυνόμενος ἢ δυσωπούμενος, ἴσος δικαστής, εὔνους ἅπασιν ἄχρι τοῦ μὴ θατέρῳ ἀπονεῖμαι πλεῖον τοῦ δέοντος, ξένος ἐν τοῖς βιβλίοις καὶ ἄπολις, αὐτόνομος, ἀβασίλευτος, οὐ τί τῷδε ἢ τῷδε δόξει λογιζόμενος, ἀλλὰ τί πέπρακται λέγων. Luciani Samosatensis Opera, Vol II. Lucian. Karl Jacobitz. in aedibus B. G. Teubneri. Leipzig. 1913. Let me have a historian like this: without fear, impartial, free, a friend of frank speech and truth, one who, as the comic playwright says, calls a fig a fig and a σκάφη a σκάφη; one who does not dispense anything out of hatred or love, who is not sparing or pitying or respecting or being timid; an evenhanded judge, kind to all, but only until he takes away from another more than he ought; a peregrine among books, but a citizen of none, a law to himself, not subject to a king, never heeding what this or that man may think, but saying what was done. Astonishingly, there appears to be an entire German monograph on this passage of Lucian. Probably it clears everything up, but alas, I have no access to it here in the Philippines. Lucian evidently uses the saying as a model of frank speech sine ira et studio. He presents the saying already as a quotation, but not a quotation from Philip. Instead, it is attributed to “the comic playwright”. We might suppose this is Menander, who was by far the most popular comic playwright of the Hellenistic age, were it not for the fact that Philip, who also knows it (if Plutarch has not put it in his mouth anachronistically), died when Menander was 5 or 6 years old. Aristophanes is another possibility. In light of this, I submit that the fragment quoted fully by Lucian, and partially by Philip, is likely to be from Aristophanes or some other writer of Old Comedy. If that is the case, the mind of a Wise and Otherwise player may try to reconstruct the logic of the saying with that sort of comedy in mind. Not that that will be easy: Greek Comedy, whether Old, Middle, or New, is a very difficult genre in which to reconstruct context for a fragment: it is full of puns, double entendres, and humor both scatological and sexual. τοῦ μὲν μέγα καὶ παχύ. τῆς δ᾽ ἡδὺ τὸ σῦκον. having no cares and gathering figs. The bride’s fig is very soft and tender. And with that, we have our probable answer: Aristophanes uses the word “fig” for things that, unlike shovels, are objectionable in polite conversation. It is not hard to imagine him using the word σκάφην (“ditch”) for the same thing. It is also easy to imagine Philip calling the Quislings of Olynthus a bunch of “pussies”. So the logic of the saying is clear, in Greek at least, even if it has been lost in English. We return to where we started: the likelihood is that a “spade” is actually what Miley Cyrus was pointing to with that foam finger of hers. “Can we unearth any?” Terrible! I was wondering if I could ask you a quick question about your translation? (I’m actually working on a history of this phrase for a freelance article I’m doing.) My email is in my comment details. And, perhaps new to the Google books offerings since you checked, the German monograph on this subject is available now online, free, at http://tinyurl.com/spadespade This is the Google scan of a book in which the monograph begins on page 29. I look forward to hearing what you discover; alas, I do not read German. It’s only 6 pages, beginning on page 29 of this book. I look forward to reading your comments on Kessler, as I don’t read German. Oh darn it, first I double-post because WordPress seemed to reject my password and the comment didn’t appear soonly enough, then I find when I look that Kessler kindly wrote in Latin not German. All the better for me, since my German is lousy, but my Latin is good. I’ve always wondered if it was really a mistranslation on Erasmus’ part or deliberate censorship.